The Finishing Room is a room inside of the Old Clockworks in Luigi's Mansion: Dark Moon. The Finishing Room is accessed by taking the first or second left doors inside of the Transportation Hall. The Finishing Room has two tables, one has a wooden sculpture of an arrow pointing towards a door while the other has wood shavings. The brown rock flooring is broken in some parts, revealing the old brick flooring. There are a couple of welding masks hanging by some tools and a small kiln is found on the upper floor. Behind the stairs, there is a secret passage that takes Luigi behind the barred window. If Luigi peels off the curtain from inside, it reveals a door that takes Luigi to a Bonus Challenge. There's a hole near the kiln that Luigi can investigate to get a glimpse of the Kiln Room. The two doors in this room lead back to the Transportation Hall. During Roundhouse Brawl, Luigi must go through the Finishing Room so he can reach the end of the Transportation Hall. When Luigi enters, the room gets dark, but there are no ghosts present. 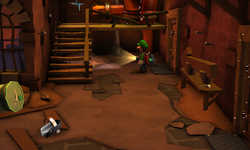 If Luigi shines his Dark-Light Device on the welding mask near the stairs, a Greenie appears behind the mask and attacks him. After capturing this Greenie and the other two that follow, Luigi can continue his mission. During Play Catch, the Polterpup enters the Finishing Room after Luigi catches up to it in the Transportation Hall. Inside the room, a Greenie is chasing the Polterpup. After the Polterpup escapes, Luigi has to capture the two Slammers and a Greenie that ambushes him. During Outlandish Interruption, the Finishing Room might be one of the rooms infested with ghosts.